Starting a new blog is time-consuming yet a very rewarding process if you stick to it. 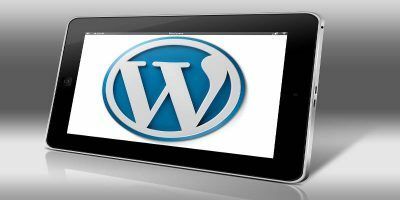 If you’ve decided that you want to use WordPress as your blogging platform, then you may be feeling a little overwhelmed. Starting a WordPress blog can seem like an extremely daunting process, especially for those new to blogging. Luckily, it’s not as difficult as most beginners think. All you need is a little extra time (an hour or two is great for getting started), an eagerness to learn, and the know-how to find answers to your questions. If you’ve been wanting to start a blog but putting it off or just not sure how to get started, this tutorial will get you up and running with WordPress in no time. Before you get started with your WordPress blog, there are a few things you’ll need. You will need to decide on a domain name or, at least, have an idea of what you want your blog to be about. The domain name doesn’t have to include any special keywords either. While it makes sense to have a keyword in your domain name, it won’t benefit you any more than a domain name without a keyword since Google no longer prioritizes keyword-rich domains. These days, a domain name doesn’t even have to be relevant to what your actual blog / website will be about. Of course, this could change in the future, but for now you really do have free range. While you can set up your own web server, as a beginner, it’s best and easiest to pay a web host to maintain it for you. Most web hosting services can be paid on a monthly or yearly basis; you’ll save money if you are able to pay at least a year up front. In this tutorial we’ll be using Bluehost as our website host. 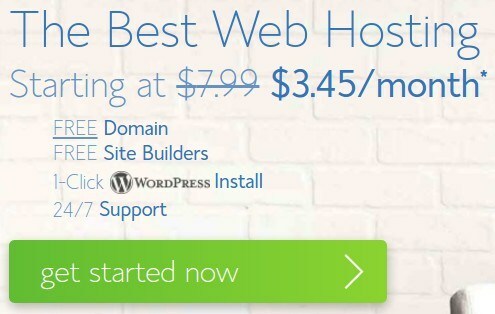 For two days only (September 26 and 27), you can start your website with Bluehost for only $2.95/month. Get started now! If you’ve already been doing some research on your own, you’ve probably come across or have heard others talking about Bluehost. Founded in 2003, Bluehost is one of the largest and most trusted web hosting service providers. They’re also recommended by WordPress.org. While Bluehost does have optimized hosting for WordPress, we’re going to get you started on a more affordable shared hosting plan. You can always upgrade later if you need more power and enhanced features. Both come with an easy and convenient one-click installation process (trust me, it’s a lot easier than installing WordPress manually). There are three different plans to choose from. 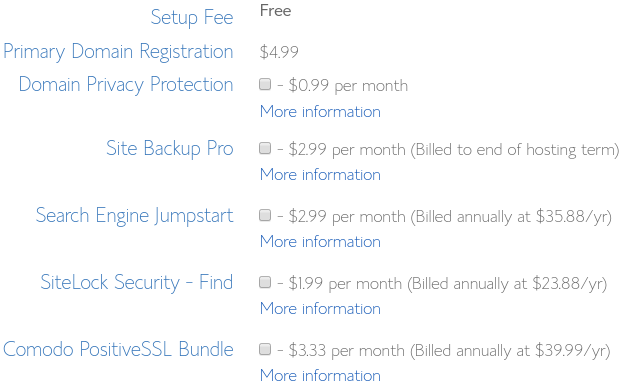 Basic – You’ll get your first year at $3.45 $2.95 per month, after which you’ll pay $7.99/month. 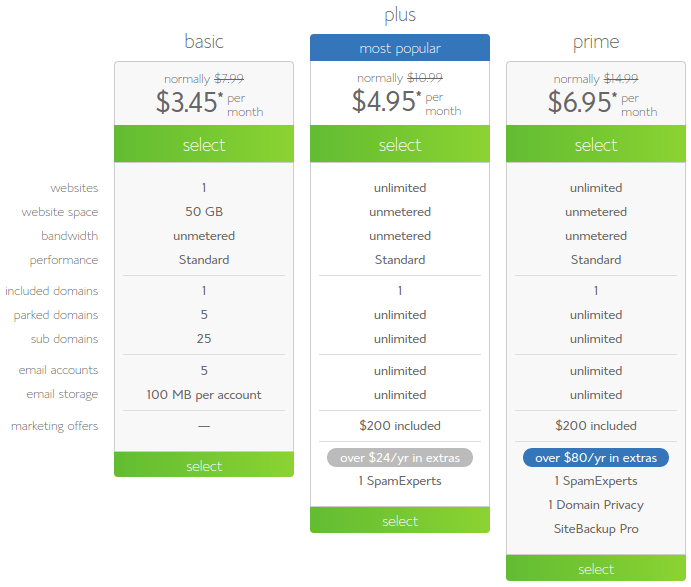 On this plan you can only host one website, and you’ll get 50 GB of website space. Plus – You’ll get your first year at $4.95/month, after which you’ll pay $10.99/month. On this plan you can host an unlimited number of websites, and you’ll get unlimited website space. Prime – You’ll get your first year at $6.95/month, after which you’ll pay $14.99/month. Like the Plus plan, you can host an unlimited number of websites, and you’ll get unlimited website space. To get started with Bluehost, you’ll need to click on the green “get started now” button on the homepage. From there you can decide on a plan and click on the green “select” button to set up your account. You’ll be asked to enter your desired domain name, or you can transfer one that you already have. What’s also great is that they have fourteen domain extensions to choose from like .tech, .online, .store, .club, .info, and more. As long as the domain you choose isn’t taken, you’ll be able to create your account. Along with your name, address, and email address, you can add on other features to create your very own custom package. Maybe you want extra security or Domain Privacy Protection; the choice is yours. Also, you should note that all extra features are charged on a monthly basis except for Domain Registration which is a one-time, mandatory fee. You’ll also need to enter your credit card information here. Visa, MasterCard, Discover, and American Express are accepted, but there’s no PayPal option (for those who are curious). Be sure to read the fine print here. 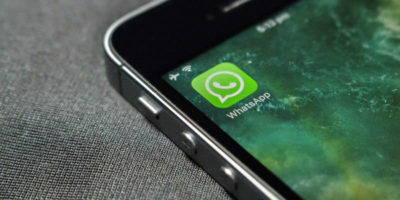 Basically, it lets you know that the special, lower monthly price is only for new customers and will only apply to your first month of service. Also, your selected products and services will automatically renew each month and be charged to the credit card entered. After signup, you may see some special offers that you can take advantage of. If you’re not interested, click on “no thanks” in the bottom right corner. Finally, you’ll come to a confirmation screen letting you know that your payment was successful, displaying your account, billing, and package information. This is a good time to verify that everything is correct just for safe measure. You’ll also be sent an email asking you to verify your contact information. There will be a link that you’ll need to click in that email. Be on the lookout for an email from Bluehost with your Account Information which includes your username, temporary URL, email server, and nameservers. You may have noticed that you weren’t asked to create a password for your account when initially signing up. You’ll be prompted to do that on the confirmation screen. Just click on “create your password” and remember to keep it secure. 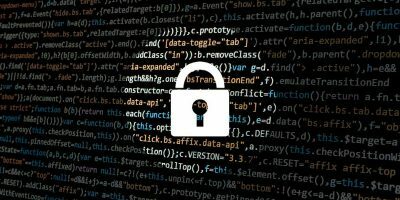 Once your password is created, you’ll be directed to your Bluehost “Home” where you’ll see many options like helpful resources, marketing tools, email tools, website tools, file management tools, and more. 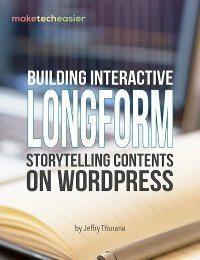 Once you’re done checking things out, it’s time to install WordPress! Now, we come to the easiest part of this entire process: installing WordPress. Since Bluehost does all the hard work for you, it’s just a matter of waiting until the job is complete. You’ll need to go to cPanel (the Control Panel) to get the ball rolling. 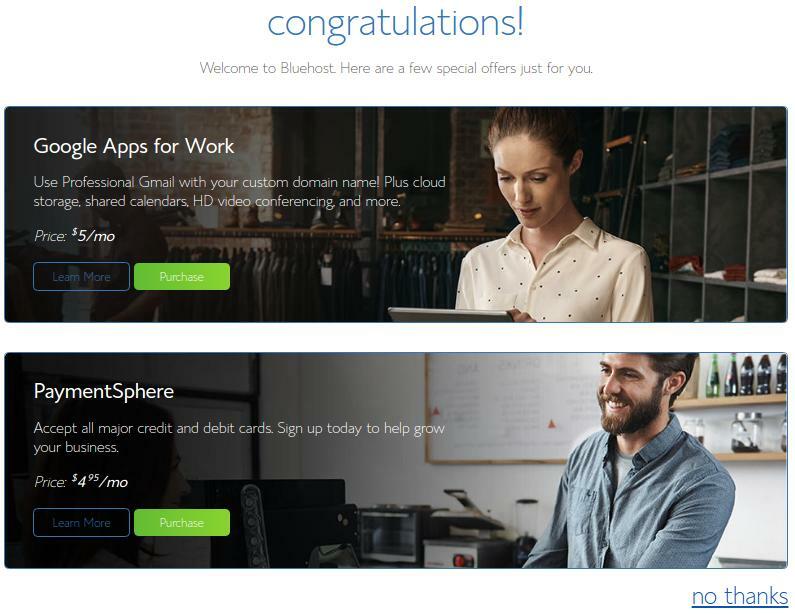 You’ll first see a screen welcoming you to the Bluehost Marketplace. Next, you’ll choose a domain to install WordPress on and you can also specify a directory. 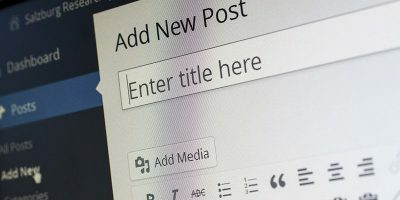 If you plan to build a website around your blog, you may want the blog to be installed on “http://my-domain-name.com/blog” instead of just at “http://my-domain-name.com.” However, if you’re only going to have a blog, you can leave directory blank so that it’s installed on the root (main) directory. Finally, you’ll need to enter your WordPress blog name / title along with your desired Admin username and password. This information can be changed once WordPress is set up (in Settings), so don’t worry if it’s not to your liking. Once you select all the checkboxes below that, click on the green “Install” button. You’ll be directed to a new page and will see a spinning wheel at the top letting you know that WordPress is being installed. Upon completion, you’ll see a green circle with a checkmark in the center letting you know that the installation process is complete. It literally only took a minute to complete. Click on the word “here” as seen in the screenshot above, and hopefully you’ll see that your installation was successful. Bluehost will try to sell you some themes, but don’t worry, there are plenty of free themes available, so you don’t really have to get one from Bluehost if you don’t like what they have to offer. We’ll show you where to find those and how to install them in the next article. Also, you can always go back to their theme marketplace later; it’s actually accessible via your WordPress dashboard. 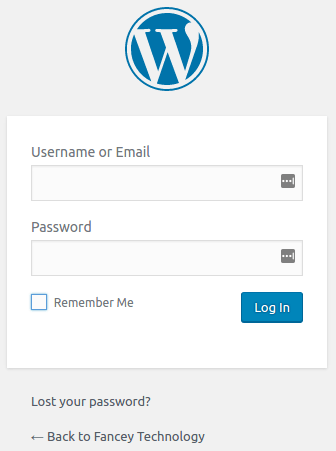 To sign into your WordPress blog, click on the link next to “Installed to” (as seen above), or simply go to “http://my-domain-name.com/wp-admin,” and use your username and password to sign in. Once signed in, you’ll see a “Welcome to WordPress” screen. You can choose to let WordPress walk you through the getting started process or just click on “I don’t need help” if you want to do things on your own. As a beginner, it’s best to let WordPress guide you. 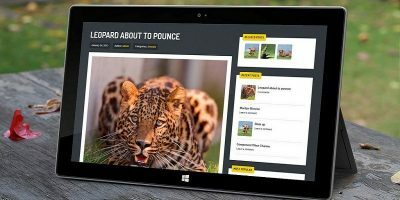 Though the short setup process, you’ll be able to edit your Site Title, add a Site Description, choose your homepage type (automatically updated with content or static landing page), build a starter “Contact Us” page, and connect to WordPress.com to improve your blog’s security and track stats. That’s it. You have started your own WordPress blog. Setting up a WordPress blog takes a lot of time, but it’s all worth it in the end, especially if you’re in it for the long haul. 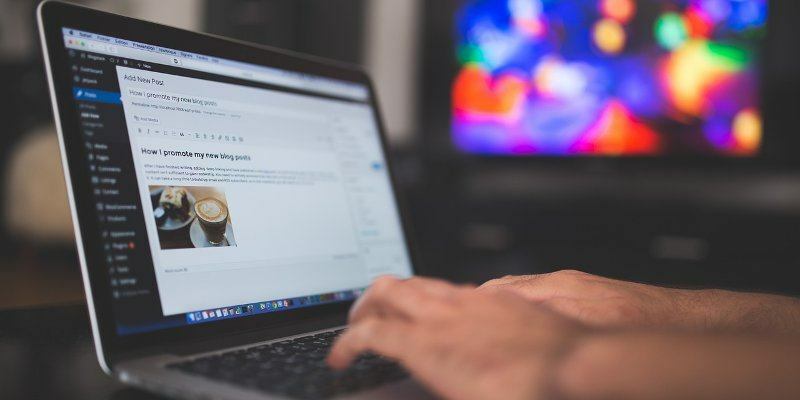 If you’re looking for total control over your blog and want the best when it comes to customizing the look and adding features, WordPress and Bluehost are the perfect duo for the job. 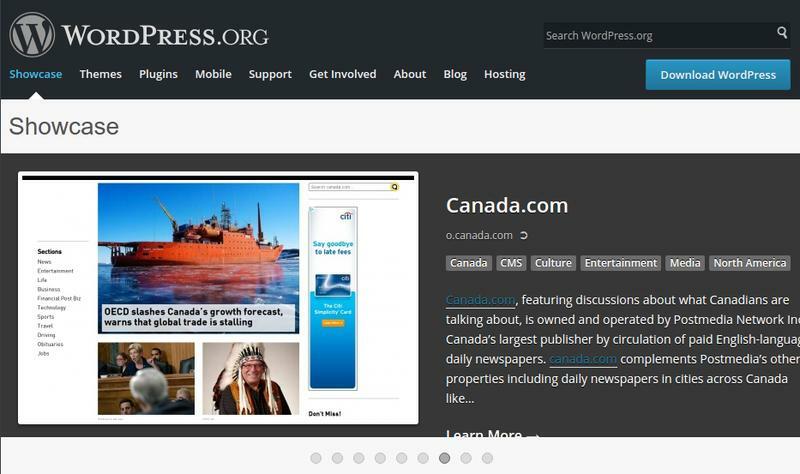 In the next article we will show you how to customize your WordPress blog. Thanks for the step-by-step guide Charnita.